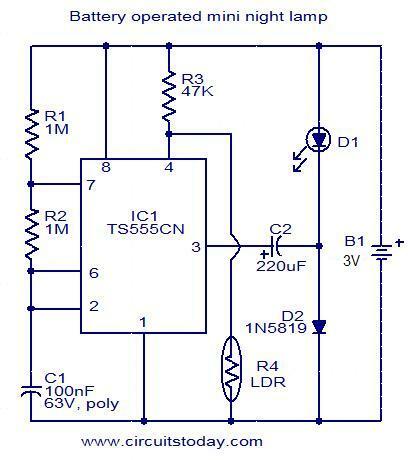 This is the circuit of a low power LED night lamp that will automatically switch OFF at day time. The CMOS timer IC TS555CN is wired as a square wave generator operating at around 5Hz.The output voltage from the IC1 is doubled using the combination of capacitor C2 and diode D2 in order to drive the LED. The LED can be a bright white LED. At day time the resistance of LDR drops to few K Ohms and inhibits the IC from producing oscillations. The circuit can be powered from two 1.5V cells in series. Any diode can be used in place of D2, but Schottky diode like 1N5819 will give more brightness. The IC1 must be CMOS type because other types won’t operate at low voltages like 3V. An optional switch can be added in series with the battery ( not shown in circuit) to provide an manual ON/OFF.